Spring has finally sprung here at Friendship Star Quilt Shop! 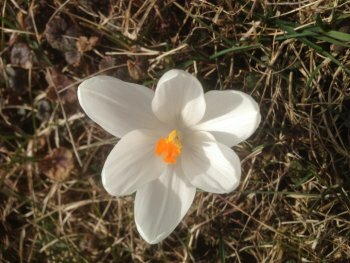 We had a white crocus and a yellow crocus pop up today! Aren't they beautiful? I didn't think Spring would ever get here. 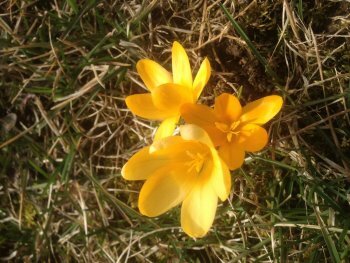 But today is a beautiful sunny Spring Day. I know I had said in our April newsletter that we were going to start sending out Sales notices in May. We decided to start to do it this week. We would also like to remind everyone that we do not allow coupons, sale items & other offers such as the Tote Bag Program to be used together. We only allow one offer at a time. They cannot be combined in any way. We hope everyone is able to get out and enjoy the sunshine and warm temperatures today. The weather folks say it suppose to stay in the 60's all week. We do have some rain coming this week but April Showers bring May flowers. My truck said it's 79 degrees outside. Obi's outside enjoying the sun & warm weather. So, quit reading your emails and get out there!